Wu Daozi was just a boy from a well-off family getting an education from monks during T'ang Dynasty China (7th to 10th centuries). One of the first lessons involved calligraphy, using an inkstone to mix water and powdered ink and a brush to create pictorial characters. Even now, in countries across Asia, the same principles are applied when people learn the art of calligraphy; proper posture, watching the master, and starting from basics (almost always the single-stroke character for the number 1 一). But Daozi didn't just see numbers, and he didn't just see the four legs of a horse in its character 馬. He saw a whole new way of communicating with people, via highly realistic paintings. He painted so quickly and so lively that the people who gathered to watch him work on murals called him Flying Sleeves. Flying Sleeves has few surviving murals, but those of his art pieces that survived have shown that his talent was unsurpassed in his time. His influence spanned centuries and spawned legends. All because he was given the chance to handwrite at school. With more and more schools taking handwriting off the agenda, are we losing our chance to find the next Wu Daozi? 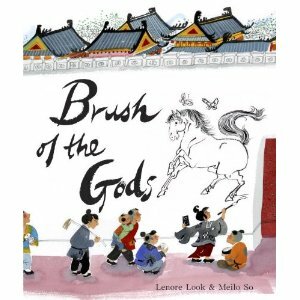 Look creates a story of a legendary artist in a time far in the past that is relatable to young kids who are also starting to write. His passion for his art is evident, and the book has a great message about following your dreams wherever they take you. So's illustrations add another layer to the story, giving information on daily life in ancient China, including food and clothing of rich and poor alike as they watch Flying Sleeves perform. My daughter loved looking at the elaborate T'ang Dynasty headwear. She clearly differentiates between her story and the paintings of Wu's by using colour very effectively.